Tien-Thuoc was the fourth child of Tran Tien-Muu. He was born in 1892, year of the Dragon, at the hour of the Ox on the 8th day of the 9th month. He studied at the Quoc-Hoc college in Hue where he graduated in 1913 with a Diploma in Franco-Vietnamese Primary Education. He was 21 when he began his 20 year career in primary school teaching. 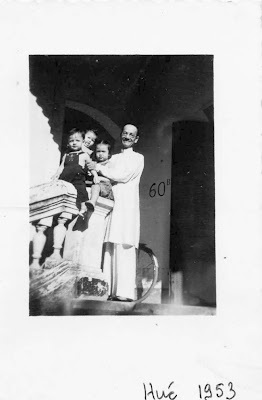 By 1933, he had become the Director of Primary School Teaching in the Quang-Nam province. In 1922, Tran Tien-Thuoc married Cong-Nu-Cuc-Phuong. She was the eldest daughter of Prince Tuyen-Hoa-Vuong, younger brother of Nguyen emperor Thanh-Thai. A year later, in 1923, my grandmother, Phuong Lan was born. Sadly, she never knew her mother because not long after her birth, the couple realised that they could not resolve their incompatibilities and mutually decided to regain their respective freedom. The more bitter side of this story is that the princess eloped to France with a Frenchman and abandoned her daughter. A couple of years later, Tran Tien-Thuoc remarried with Ton-Nu-Chi-Huyen. She was the eldest daughter of Senior Mandarin of Rites, Buu-Van, himself a descendant of poet prince Tuy-Ly. Following several years of married life, it became evident that Ton-Nu-Chi-Huyen could not give her husband the male heir that he hoped for. She began her quest for a concubine more apt for this role. In 1935, concubine Ho-Thi-Hong was introduced into the family and a year later, gave birth to a little boy named Tran Tien-Nam. The family was based in the provincial capital of Quang-Nam. The name of this town was originally Hai Pho (Seaside Town) but was known as Faifoo during the French colonial period. Today, it is called Hội An and is World Heritage Listed by UNESCO since 1999. In 1943, Tien-Thuoc left Faifoo and came to reside in Hue. He was designated “Ta-Ly” (Chief Archivist) at the Royal library of Hue where he worked for 2 years. From 1945, Tien-Thuoc was officially retired but continued to pursue an important part-time role within this institution, over many years. 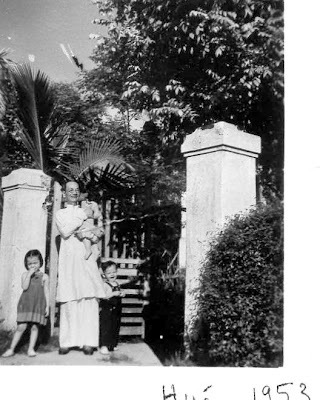 From 1946, the family lived in a “compartiment” (a one floor house, adjacent to other similar buildings) along the Phu-cam canal in the Southern part of Hue. This was the modern part of the city delineated by the Perfume River where government administrative buildings and the university were also situated. In 1965, Tien-Thuoc moved to Saigon where his son had just been admitted to the Military School of Medicine. After suffering a bad fall several days earlier, Tien-Thuoc died of a cerebral embolism on 26 December 1967.